It took only a week to make Pastor Jeff dangerous. A team of church communication pros descended on his church to share their knowledge, a venture known as Creative Missions. The status quo is now endangered. Is your church ready to be dangerous? This booklet is written by the reinforcements, men and women in the trenches of church communication. They’re Creative Missions alumni and now offer that same insight, wisdom and help to you. This booklet includes 19 essays on church communication, covering basic strategy and practical, real world tips for churches that want to be dangerous. 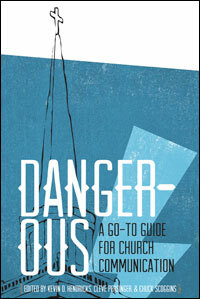 Dangerous: A Go-to Guide for Church Communication is available in print and digital formats. Lessons and behind the scenes of the project.